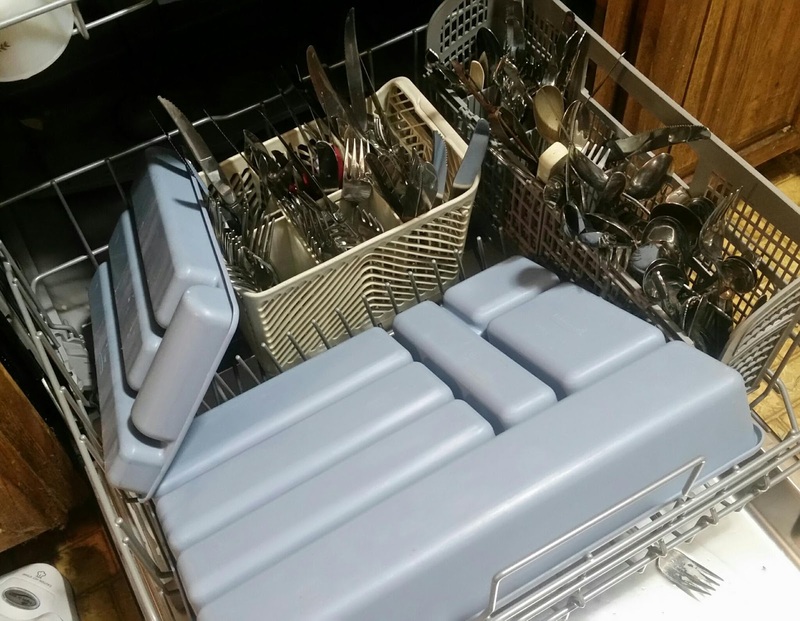 Tip - Getting a new dishwasher? Don't throw away. . .
Getting a new dishwasher? Keep the flatware basket from your old model. It will come in handy when you have a large party or you need to clean out the flatware drawer in your kitchen. Yep, I confess - I love a good casserole! Nothing beats a casserole for a fast, easy, one dish meal that usually freezes well and most of the time tastes better on the second day. On Instagram I recently I saw a post by the fabulous food blogger Emily @recipestonourish for her Spinach Artichoke Chicken Casserole. It sounded fabulous and I couldn't wait to make it. It is probably one of the few casseroles I've seen that does not use "Cream of Whatever" soup as a base. We have a pantry full of fat free cream of chicken soup but I was lacking one of the main ingredients needed to make this recipe. Emily uses yogurt and whole milk cottage cheese to make her casserole creamy. We always have plain yogurt in the fridge to use as a replacement for sour cream. However, you will never find cottage cheese at my house. I loathe the stuff and jokingly refer to it as curdled cow barf. Yuck. What I did have in my fridge was ricotta cheese left over from making lasagna. Winner! See Emily's original recipe at her blog Recipes to Nourish. Three years ago I was hit with some health challenges and to make a long story short, I now use a wheelchair to get around. As a result I am no longer able to do the gardening that I loved so much and my hubby is far too busy to take it over on such a large scale. The compromise is a very small vegetable garden in the front of the house, just off the walkway so that I can handle the daily watering and harvesting. We have red bell peppers and tomatoes, lavender to attract bees and a rosemary so that I can bake Monti's Roman Bread when I get the urge. HuzBen also keeps potted herbs like parsley on the back patio. I'd be lying if I said I didn't miss my sprawling gardens of fresh organic veggies, but things aren't so bad. I've learned to shop organic and I am canning a preserving much more than before. 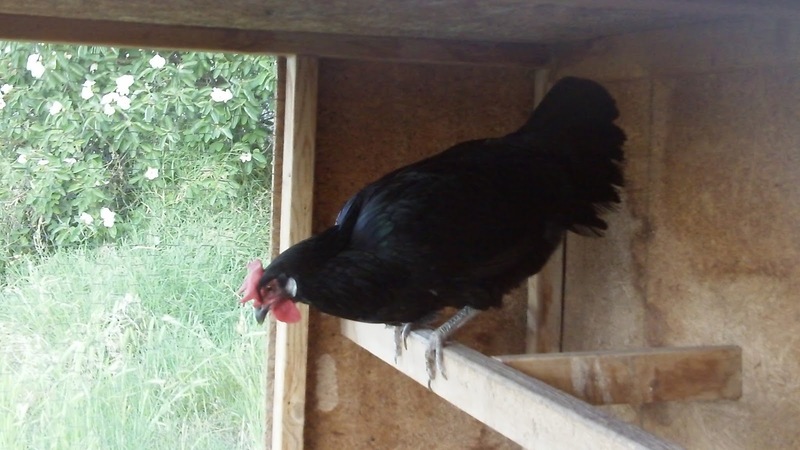 Thankfully, one thing we did not change is that we still have our hens. We are down to four; Sprite the Americauna, two naked necks we acquired when the were getting picked on in a friend's backyard flock, and we still have Mabel the black Minorca who I believe is eight years old now. She was in our very first batch of hens. And she is still laying 4-5 eggs a week. Gotta love it! A fabulous find in one of the coops today. 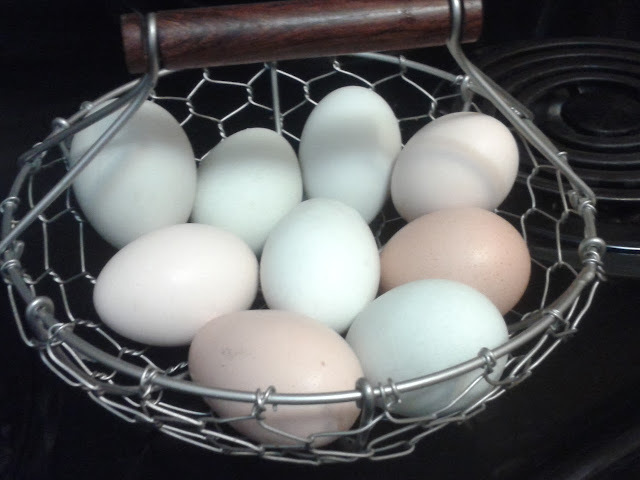 One of the older hens who has not laid an egg in ages is apparently producing again. Out of 7 hens we now have 6 who are laying eggs. Looks like the old ladies are trying to keep up with the youngsters. In human terms, this is like Helen Mirren giving birth. 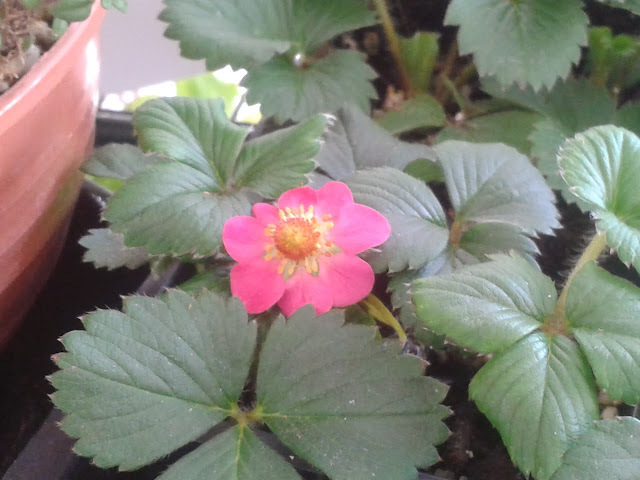 A beautiful pink strawberry blossom. As soon as I get another 6 pack of these I'll be planting the strawberry jar. Until then it's hanging out in the open greenhouse. 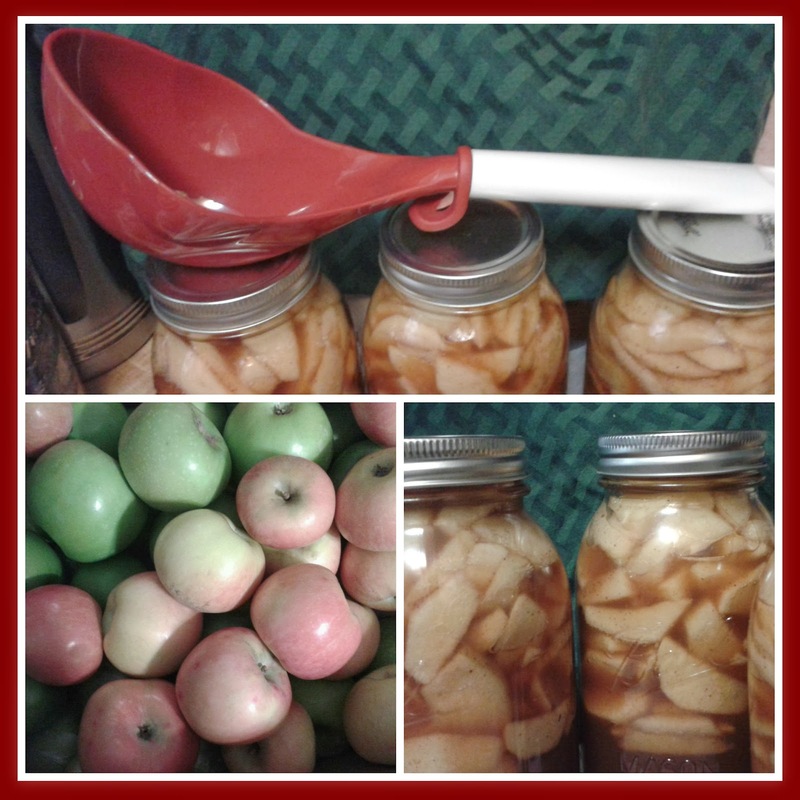 Long day yesterday- I made 6 quarts of apple pie filling. The Backyard Farmer is spoiling me by offering delivery in my area. They brought me a big box of Fuji and Granny Smith apples last week along with some beautiful heirloom tomatoes and a bag for feed for the hens. Gotta love it. I'm trying out a new recipe this year. It was quite tasty before it hit the jars so it should be pretty good in recipes. I found it here along with some good basic canning tips and a recipe for pie crust made without shortening (butter only). Before I head of to work, I must tell you all about the. . . Okay, so maybe I do like my jar lifter just as much for safety purposes, but this little beauty comes in a close second. I can't remember if I saw the Progressive International Canning Scoop on a blog or if it was an Amazon* suggestion but I am so glad I bought it. All the reviews for this were excellent. The shape is perfect for ladling fruit into your jars, but it's pointed enough at the end to be able to get out every last drop of liquid. It has a generous size bowl and a hook so you can hang it on the edge of your pot. It won't stain or rust. I love it! I used it to can apple pie filling yesterday and it made much less of a mess than my old ladle. Making jam will be so much easier with this in my canning arsenal. *And yes, I am an Amazon Associate so if you go to Amazon thru a link on my blog to make your purchase, I do get a tiny fee. That doesn't raise your price at all, but it helps me with the occasional Amazon gift certificate. And I thank you for that!